One of my favorite things about this gown is that although the top layer is loose and flowy, the very fitted underdress showing through the sheer layer keeps it from looking too tent-like. If I had to guess I would say that the movie gown’s underdress (seen clearly above) is tight-fitting satin with some extra fullness below the knee to allow for movement. Since I don’t have Audrey Hepburn’s stick-thin figure and have no intention of spending an evening in a dress so tight I can’t move freely, I’ve decided to go in a different direction and use a bias-cut underdress. Belle Epoque Wisteria Gown, Finished! It’s done! Done and– dare I say–gorgeous. I really love the way it turned out– it’s pretty close to exactly what I pictured from the beginning, and I had such a wonderful time wearing it to an 1890s-themed ball. The skirt has such a great swirl to it from all of the fullness in the back, and the dimensionality of the embroidery really makes it stand out in a crowd! Once I had all of my fabrics and sketches I decided to start with what I hoped would be the easiest part of the dress– the white underskirt. I started off by simply cutting off the upper portion of the dress’s bodice, leaving a good 3″ of fabric attached to the skirt to make a waistband. Next I turned my attention to the inside of the skirt– there was already a nice lining and net petticoat layer, but it wasn’t quite poofy enough. Luckily the lavender bridesmaid dress came with a netting layer that was exactly the same length as the white skirt, so I ruthlessly ripped out, gathered, and stitched it just below the petticoat lining. Presto! Poofy white satin underskirt! Before I went any further I had to make sure the skirt would be the right length on my daughter, but since she hates to stand still (like any almost-four-year-old) I needed a substitute for fittings. Once I had my basic design idea I started looking for fabric. 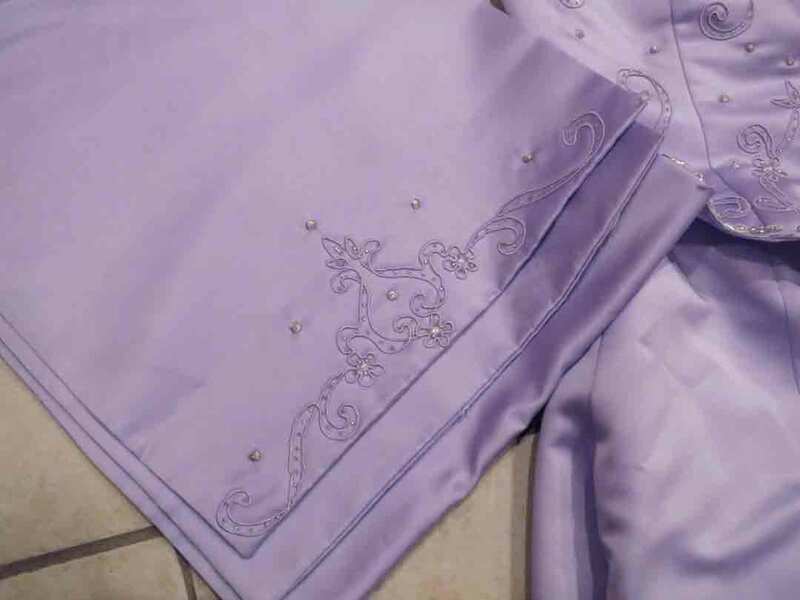 I originally figured that I’d get some lavender-colored jacquard or satin, possibly a lace or embroidered sheer for a skirt front panel, and call it a day. If I’d had easy access to a decent fabric store this wouldn’t have been a problem; however, my local store is hit-or-miss, so I turned to the internet. In searching online for the best price for jacquard (shipping is so expensive!) I had another idea– cannibalizing an old prom or bridesmaid’s dress. Pre-worn formal dresses, particularly pastel satin ones that are clearly bridesmaid’s dresses, have a limited shelf life and an even more limited price range, whether at Goodwill or on eBay. With a full enough skirt the price-per-yard can end up being significantly lower than buying it off the bolt– and the dresses often come with beading or embroidery that’s just not practical to do by hand. I started sifting through auctions online, and found the perfect gown.